Shangchai diesel Engine D6114,(or assembling Cummins engine),specially matched for construction machineries. In Rear driving axle of three section structures, "No SPIN Differential" of the company’s patent is assembled. Hydraulic operating system with synchronic/sensitive double pumps and double circuits, assembling operating valves of America make. In all hydraulic braking system, braking valve and pressure limit valve made by Rexroth company, Germany. 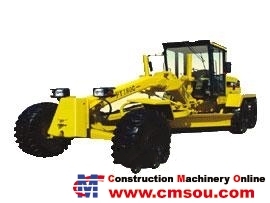 All hydraulic steering of front wheels, small turning radius make the machine agile moving. "Roller type” circle of front company’s patent, no maintenance & non adjustment, suitable for assembling auto leveling laser Device. Cab with "French Green" color glass to inhibit ultra violet light, electronic monitor, three grade alarm, and movable console suitable for all operators. The whole front fame is made with hot press formation and NC welding, lt is the only type in China. Stream lined engine hood of perfect design. Heavy blade can lengthen service life by 100% . Suitable for assembling Liuzhou ZF Transmission.